What are no-zones around a truck? The sides. Both the large area behind the truck’s passenger door and the small area behind its driver-side door are difficult for a truck driver to see—even using his mirrors as aides. Limited visibility on both sides, but especially on the driver’s right side, creates great potential for an accident. The immediate front. Especially at high speeds and in poor weather conditions, semi-trucks need more stopping distance due to their size and weight. Drivers should avoid cutting off large trucks or driving directly in front of them. The immediate rear. Keeping a safe following distance is important when driving at all times, but it is especially important when driving behind a semi. Because the trucks are so large, it’s difficult to see around them—which can make it nearly impossible to anticipate when they will stop because of traffic or an obstacle in the road. When driving near and around semi-trucks, remembering this simple rule may help you stay safe: if you can’t see the driver’s mirrors, he can’t see you. Although every driver can do her part in preventing an accident with a large truck by avoiding the no-zones, you should remember that truck drivers (or another contributing party) should still be held responsible for their carelessness, recklessness, and negligence—and any injuries and damages that result from an accident. If you or someone you love suffered injuries in an accident with an 18-wheeler, it’s important to get in touch with an attorney who can help you recover fairly. At the Hilton Law Firm, we’ll review the details of your situation, build a strong case, and help you recover what you need for injuries, lost wages, and property damages. Start a live online chat with a member of our team today. How can I find the names of people who witnessed my accident? Are there Special Rules which Apply to Truck Drivers? Commercial truck drivers are required to have a CDL, (commercial drivers license), and are regulated by the Department of Transportation. The number of hours a commercial driver can be behind the wheel without a break is strictly regulated. Commercial drivers are required to keep detailed log books about how long they drove, when they rested and for how long. Most commercial trucking companies also equip their trucks with specialized GPS devices which can show how long the truck was driven at a particular time, as well as speeds, directions and stops. 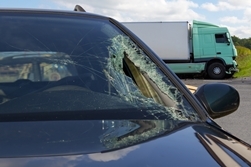 When investigating a wreck involving a Commercial Truck, the Holton Law firm will get all GPS and driver log data to evaluate the truck driver’s conduct.